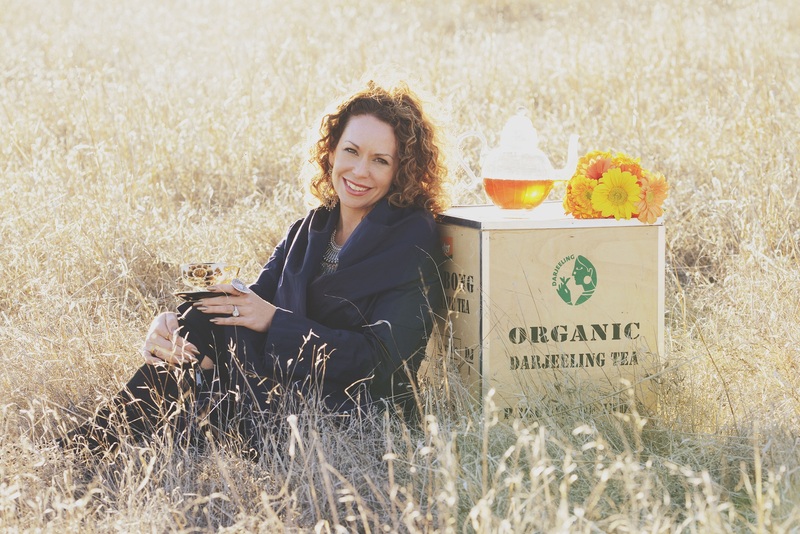 Zhena: Tea Entrepreneur, Author and Soon-to-Be TV Star? Inspiration comes to us in many ways. Some of us read a line that sets our minds on fire. Others meet someone special who serves as a mentor or offers encouragement or important tools. And sometimes, as was the case of Zhena Muzyka, there was no small amount of desperation in the decision to launch a business. Muzyka was twenty-four years old when she found herself in a frightening situation. She was already struggling to get by, behind in her bills and begging to keep her gas line open even though she was months behind in her payments. She was nine months pregnant with no job prospects ahead and her baby’s father was not in the picture. Her parents weren’t able to help and then, her baby son was born with severe medical problems. The situation was beyond bleak. She took a risk, creating a business plan to open a tea shop near her Ojai, California home. She pitched it to someone looking to sell his cafe business and he was swept away by her passion and business savvy. He hired her as a consultant to transform his cafe. This led to opening her own tea cart and, eventually, creating Zhena’s Gypsy Teas. 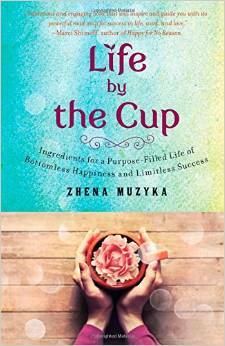 Muzyka is now releasing her first book about her life and her business, “Life by the Cup: Ingredients for a Purpose-Filled Life of Bottomless Happiness and Limitless Success.” The book’s chapters are designed to be short enough to consume with a cup of tea. She tells stories of her life as a mom and a business owner. She intersperses these with meditations and exercises to encourage readers to think about their own lives and aspirations. This book is part of a three-part deal with Simon & Schuster. In addition, she has signed a development deal with Mark Wahlberg and Leverage Management to transform the book into a movie or television series. The book was released June 17. Tea Biz had the chance to talk with Zhena about her new book. Here are some excerpts from our interview. Tea Biz: Tell us about the structure of your book — with the short chapters and the exercises. What inspired the format? Zhena: I didn’t want to just write a memoir. I wanted it to be instructive. I spend time helping other women in business and I’m focused on making sure my lessons help people. It shouldn’t just be me reiterating old stories. I was talking to my girlfriends and they said you should be able to drink a cup of tea while you read each chapter. I looked at my chapters and the word count was much higher. I really had to cut them down. It’s compassionate for a busy schedule. Tea Biz: What was your inspiration for your tea work? Zhena: I loved throwing events so when I had to make money out of nothing I came to the conclusion that tea was in two categories – English high tea and the Asian side of things. No one was doing it gypsy style. Tea Biz: What is gypsy style? Zhena: It has more of a bohemian flair. It is more mystic. In the Asian style, mindfulness, grace, relaxation, focus and clarity come first. It’s like a martial art. Gypsy style is more of a celebration, more colorful, more bohemian circus-like. Tea Biz: In those early days you were facing a terrifying time with your son when some would have just wanted to give up. Where did you find the strength to try to start something new at that point? Zhena: I’m not different from any other mother that is faced with something frightening. My options were very limited. My parents were not in a healthy position physically or financially. Sage’s dad was not in the picture. I didn’t have a Plan B and I didn’t have a rich aunt. I really always thought that would happen. Maybe I watched too much Disney as a kid growing up. I thought that something would happen and I’d be saved. Then I realized that there is no saving. We have to do the work ourselves. The more I got into the work, the more I had the chance to actually fulfill my own potential. That was so much fun for me. I hadn’t found anything other than writing that really made me feel that way. Blending teas, making teas, selling teas, becoming a fair trade and organic activist were what I needed to do. I believe we’re put on earth to fulfill our potential. I found strength through seeing it work because I had no other options. What kept me going was realizing that no one could save me. This was more fun in the long run. Tea Biz: You went and pitched a business plan to take over a cafe with no money in your pocket. Was that one of the scarier things you’ve done in your career? Zhena: I didn’t have the money, but I was starving for an opportunity. I almost turned around but there was a voice in my head that told me to just show up. I still get that to this day, that loud voice. It happened a few months ago. I was tired and didn’t want to go to a conference. I wanted to hang out with my kids. I just kept hearing this voice telling me to show up and it was life changing. I met my designer who designed ZHENA TV and a friend who is a Hay House author. The scarier something is and the more resistance I feel, that is when good things happen. I had nothing to lose. Writing the business plan made my confidence grow. If you don’t know how to do something, it’s in the learning how to do it that you gain confidence and mastery. When I showed up with no money and was hired as a consultant it was the scariest but I was then empowered to take control of my life. Tea Biz: You left the consultant job eventually to start a tea cart. That was a bold move. Zhena: The tea cart was me jumping in with both feet. Definitely ready, shoot, aim. I decided that I had to do my own thing and I didn’t want to do it for someone else anymore. Tea Biz: You had the chance to visit Sri Lanka, to see where tea is grown. What was most striking about that experience? Zhena: I met the queen of the gypsies and a mentor at the time told me I should study meditation. He told me I was a blender without a top. Visiting Sri Lanka I saw true suffering which really put what I thought was suffering in perspective. When things were at the hardest for me, Sage and I at least had a social safety net that caught us. We could get the operation and save his life. They don’t have that. Even in poverty I was actually one of the most fortunate people in the world. It was eye opening and I was energized to do something. Tea Biz: This is the first of three books. Tell me about your next books. Zhena: The next book, Business by the Cup, is a spiritual business book for women, focusing on exceptions, not rules. They are the lessons I learned like working for the sake of work, not for outcome. It is a handbook for a woman who wants to grow a business and make a mark in the world. The third book, Love by the Cup, is about my Ukranian grandparents. When Sage was born I had a draft of a book called “A Modern Gypsy’s Guide to Life.” My grandfather was a freedom fighter, wanting his freedom and an independent country. I spent forty hours interviewing my grandfather about stories of World War II and surviving five years in a concentration camp. My grandmother kept it a secret that she was a gypsy. Gypsies are still treated like third class citizens and no one is telling the actual stories and beauty of gypsy culture. Tea Biz: And you also secured a development deal for TV? Zhena: The guys who created Boardwalk Empire, Entourage, In Treatment, etc., Mark Wahlberg and Leverage Management optioned it for a movie or television series. That was completely unexpected. I didn’t even know what movie rights were. I’m learning this industry as fast as I can!